From the creator of Music Player (Remix) & GeoStrings comes Quick Post, the easiest way to post to all of your Twitter & Facebook accounts. Quick Post allows you to focus on what you're posting, not on how you do it. - Send messages or photos to multiple Twitter and Facebook accounts simultaneously. 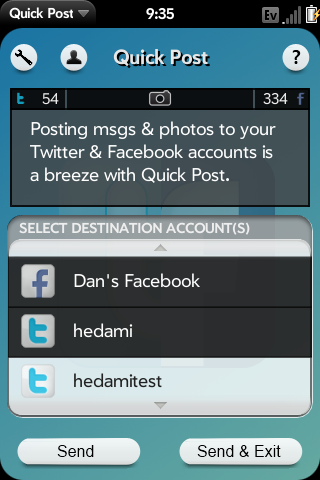 - Using Just Type found in webOS 2.0 or later, send messages to multiple accounts using configurable shortcut prefixes. And unlike other apps that use Just Type, the app will not load a card where you have to confirm the operation. It just works! - When no internet connection is present, messages are queued up. Once your internet connection is restored, the messages are automatically sent. - Advanced configurable message compression techniques are used to ensure messages fit within the maximum character limit. Each compression technique is applied in series so the message is only compressed enough to fit within the character limit. - Messages that fail to compress enough will be automatically split into muliple pieces with X/Y message counters. Twitter mentions will be automatically cc'd to each message piece. - Incomplete messages are automatically saved as a draft. When you re-open the app, you can restore the draft including the previously selected destination accounts. - Optionally assign your own titles to your accounts. By default your screen name is used as the title. 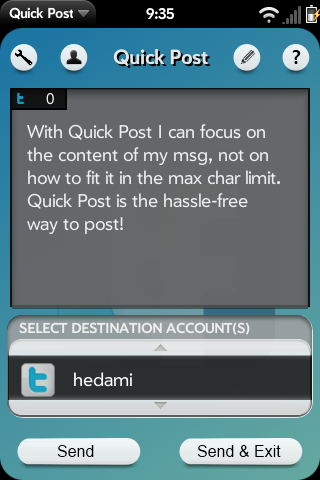 Quick Post is the perfect companion to your favorite Twitter and Facebook apps. Posting messages & status updates is now an easy, care-free experience using Quick Post!